The knee is one of the largest joints in the body and a frequent site of injury, such as patellar dislocations, ACL, and meniscal tears. 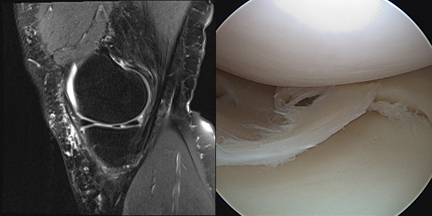 Both traumatic and degenerative injury can lead to cartilage defects. Depending on the degree of damage and patient age, the defects can be treated with cartilage transplants or joint replacement surgery. The femoral condyles are the two rounded prominences at the end of the femur; they are called the medial and the lateral femoral condyle, respectively. The motions of the condyles include rocking, gliding and rotating. Any abnormal surface structure or cartilage damage can lead to cartilage breakdown and arthritis (loss of cartilage padding). The Tibia meets the Femur at the knee in two areas on which the Femur rides. This area called the Tibial Plateau is divided into a medial (inside of your knee) and a lateral (outside) part. The Patella is a bone that lies within the quadriceps tendon. It rides in the shallow groove over the front part of the Femur called the Trochlea. The Patella acts as a lever arm to help the quadriceps muscle extend the knee. Several bones meet to form the knee joint; it consists of the femur, tibia, and patella. These bones are held together by ligaments, which connect two bones to each other, and tendons, which connect a muscle to a bone. Articular Cartilage, also called Hyaline Cartilage, covers the joint surfaces where the femur, tibia, and patella articulate with each other. This glistening white substance has the consistency of firm rubber but has very low friction to allow sliding motion with almost no resistance. With normal joint fluid for lubrication, the surface is more slippery than ice-on-ice and allows smooth and easy knee joint motion for decades. This degenerative process is complex with a combination of abnormal mechanical forces and destructive enzymes. There still are a number of unknown questions regarding the rate of progression, but what is known is that once the degenerative process is initiated it is difficult to stop. That is the reason why it is so important to prevent or halt this negative cycle before painful symptoms significantly restrict your level of activity and hamper your quality of life. 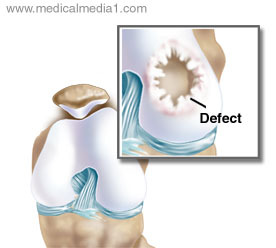 With end-stage osteoarthritis, your only course of treatment then becomes a total joint replacement. 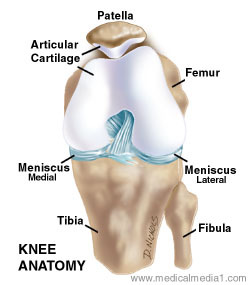 Meniscus cartilage is the other type of cartilage in the knee and is made of a substance called fibrocartilage. There are two of these C-shaped pads in each knee, one on the medial (inside) part, and one on the lateral (outside) part. They are attached to the tibia and lie between the tibial plateau and the femoral condyle to cushion the forces of walking, jumping and running. They accomplish this by distributing joint forces over a larger area of the joint — transferring force from the curved femoral condylar margins to the flatter tibial plateaus. 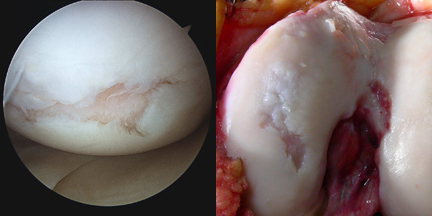 If the meniscal cartilage is injured, it might have to be removed or repaired arthroscopically. 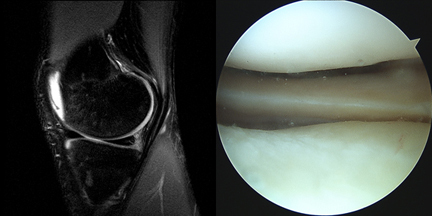 If the entire meniscus is lost due to injury and/or surgery, the articular cartilage of the joint is exposed to much higher stresses and starts to break down, resulting in arthritis.